Asparagus-spinach pesto is really tasty. 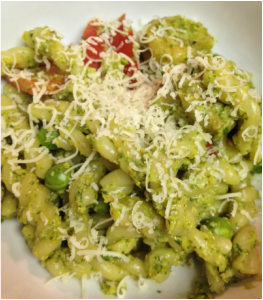 When I first heard that this pasta has asparagus in the pesto, I was intrigued. This recipe is from Gimme Some Oven, a food blog I follow. This is a great weeknight dinner or a tasty summer pasta salad. I'm testing out how well the pesto freezes. 2. While the pasta is cooking, add the shrimp to a small bowl and toss with the blackening seasoning until covered. Heat olive oil in a skillet over medium heat. Add in the shrimp, and cook for 5 minutes, turning occasionally, until the shrimp are cooked through and pink and no longer translucent. Turn off the heat, and transfer shrimp to a separate plate and set aside. 3. Make the asparagus-spinach pesto. Boil asparagus in a medium saucepan for 2-3 minutes, until bright green and tender. Run under cold water to stop the cooking. 4. In a food processor, blend asparagus, spinach, garlic, Parmesan cheese, pine nuts, lemon juice, and salt until combined. 5. Drizzle in some olive oil until pesto is a nice consistency. 6. When the pasta is al dente, reserve 1/2 cup of the pasta water then drain the pasta. Return the pasta either to the pot where it was cooked. Add the pesto to the pasta, and toss until evenly coated. Stir in the shrimp and pine nuts. Sprinkle with some extra Parmesan cheese. This can be served hot or cold as a pasta salad.